So far they’ve put forward a number of deeply unpopular and quite honestly barbaric policies, all in the name of reducing the deficit. Most of these have been targeted at reducing the welfare bill (which is considerable), but it does mean that Osborne has decided to pay the deficit by cutting funds to those in our society who need it most. No surprises there, then – that’s just basic Tory ideology. 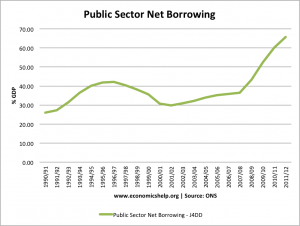 The graph over on the right shows how much the UK public sector (aka the Government) has borrowed over the past few decades, over and above the amount we raise in taxation. This is a not inconsiderable amount of money. 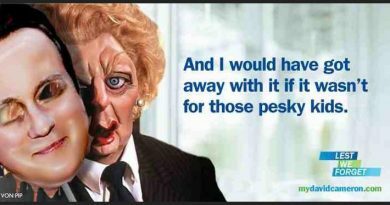 Note that borrowing was up in the early 1990s (linked to a European economic crisis and rising UK inflation rates culminating in Black Wednesday), under John Major’s Conservative government. 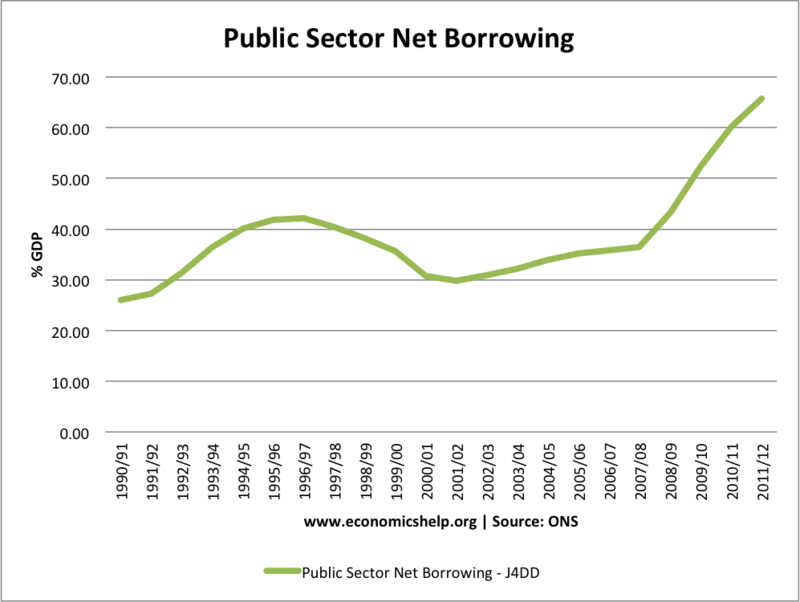 Borrowing then started to drop in 1997, pretty much coinciding with the election of Tony Blair’s Labour government. Borrowing continued to drop until 2002/03, when it began to increase. This rather unsurprisingly coincides with the build-up to and outbreak of the Iraq War. A rather more noticeable spending increase occurs in 2008/09 (by which point Gordon Brown was leading a Labour government) which coincides with the collapse of the US housing market, and ultimately the global economic crisis we’re just starting to escape. David Cameron’s Tory / LibDem coalition was elected in 2010, on a programme of austerity and deficit reduction. The austerity has definitely begun to bite – noting the massive cuts to public services, the near-privatisation of the NHS and sweeping cuts across the entire public sector – but note also that public borrowing is still increasing. Perhaps a more useful descriptor of the deficit is to look at how much actual debt the UK has owed historically (as a percentage of GDP). This is described in the graph to the left, which shows figures dating back to 1918. You can immediately see the massive spike in debt in the 1940s – right when our country was at its poorest, and we were spending the most (there was a war on…) – we can also see that debt has never come close to this level since (despite what various doomsayers would have us believe!). We can see (by looking at the events alongside each debt spike) that national debt has much more to do with outside forces than anything else. Our current recession is quite obviously nowhere near as serious as that of the 1920s/30s, nor are our current levels of borrowing anywhere near the heights required of us during the Second World War – but we can still see that borrowing rises when something else impacts our economy, and only drops significantly when this outside force loses significance. 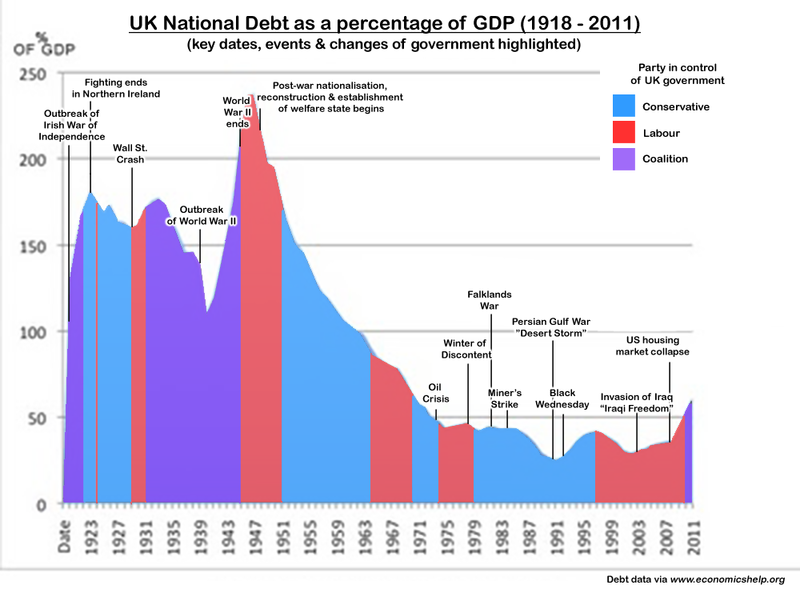 In other words, British governments have historically borrowed more money as the economy weakened, and then repaid this national debt (repairing the economy in the process) when the outside forces are removed – partly because a weak economy is a poor time to save money, but mostly because it’s simply not possible to save money (and pay off the debt) when the economy is at its weakest – doing so simply weakens the economy even further! One of the clearest examples of this is the post-war reconstruction and nationalisation (including the establishment of the NHS & an effective welfare state) embarked upon by Attlee’s government: this is probably one of the most ambitious spending programmes ever enacted in British history, and it took place at a time when (as we can see from the graph) borrowing & debt were already at an all-time high. So What Do These Graphics Show? 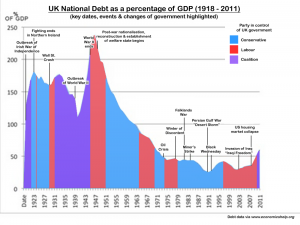 Primarily that, contrary to Tory spin (and popular belief), the last Labour government didn’t “ruin the economy”; they initially repaired the debt accrued by Major’s Tory government, and increased spending only when outside forces demanded it. We can certainly blame them for the Iraq War (which was expensive in more than just financial ways), but the Tories would have acted no differently. 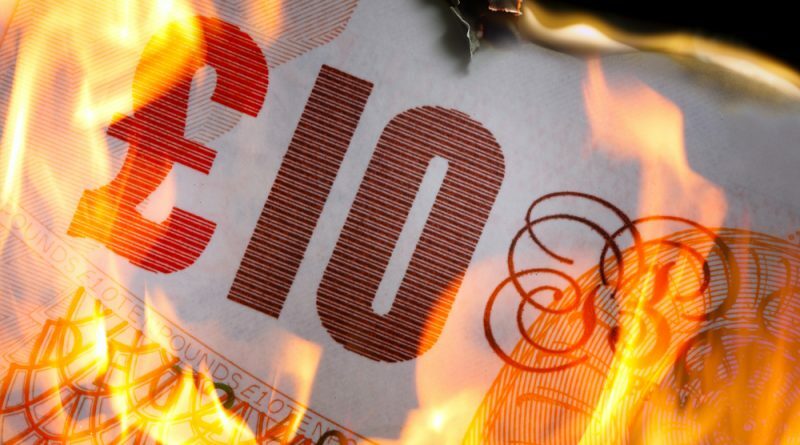 We can’t blame Labour for the collapse of the Housing Market – we can wish they had done more to insure us against such a catastrophic financial meltdown, but even with 20/20 hindsight that would have been rather difficult. 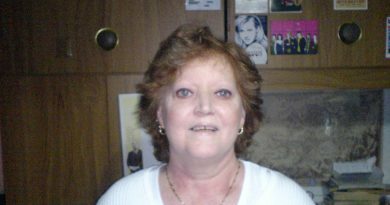 What the previous Labour government did do was insulate its citizens, to some degree, from the effects of the financial crisis – rather than imposing austerity measures (which, as we can see do not work) & cutting public services, most of us were able to face a recession knowing that we didn’t also face food & fuel poverty, a lack of healthcare & even homelessness. And we can see that, despite Osborne’s claims, our current government’s austerity measures are not making an impact on the debt – it’s still increasing (at almost the same rate), despite the global financial market’s tentative recovery. 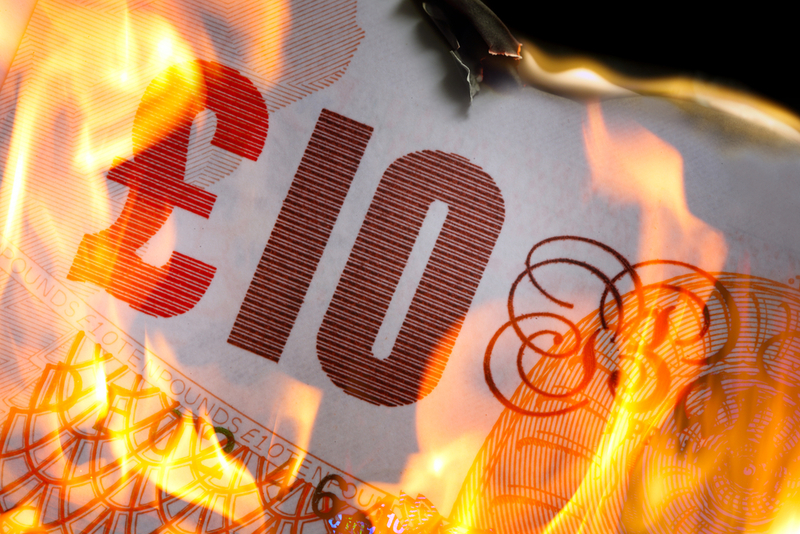 We can’t expect any chancellor to repair the entire British economy in just two years. We can expect him to realise that the economy will take a long time to recover, and that his current plan is not working. Which is why it is not just disappointing, but actually terrifying to hear Osborne, Cameron et al refuse to even countenance any kind of economic ‘Plan B’, when we know his ‘Plan A’ boils down to cutting essential services to British citizens and hoping the economy will magically get better. I don’t think this is because they believe their economic policy is a success. It isn’t, and every single descriptor points to its failure; they’d have to be morons to think it was working. But it’s now becoming clear that the one thing more important to Cameron & Osborne than actually fixing the economy is refusing to admit that they are wrong. It is certainly true that most of all politicians (actually, people in general) never want to admit when they have been wrong, and often enough rather continue that wrongness so long as it helps them keep up the illusion. However, I think there is a genuine modern class war, waged from above (and quite successfully), with the major purpose of upholding a status quo of divide et impera – the intention is to establish and maintain trenches of jealousy and mistrust between different parts of society. As long as anyone can delude themselves with blaming someone other than those in power, the ruling elite can basically do whatever they please, because any time something goes bad, they can point at any specific group of people single them out as the alleged cause, and a sufficient amount of people will believe that. This all happens both within each country as well as between them, as spectacularly shown by the deep divide between Germany and Greece at the moment, where each country’s population blames the other country as a whole, not seeing that the actual enemy is not the people of either country, but the rulers of both put together. As a saying goes here, I cannot eat as much as I’d like to vomit when hearing and reading the bile directly at the Greek coming from almost all major news services. P.S. : It does not help that major parts of the Left Party here in Germany are utter fools. A high-ranking member took part in the recent demonstrations in Athens, and as soon as he was scolded by out government, he claimed that he did it “to help protect the German tax-payer”. EPIC FACEPALM! Definitely – the other common thread running through British history (and that of most nations) is that those in power are from disproportionately wealthy families. 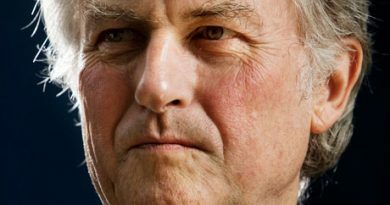 Even parties of the left are increasingly stuffed with dynastic politicians who have inherited wealth, power & influence from generations of millionaire parents – not that I necessarily have a problem with rich people, just that I think they need to make room for ordinary and poor people in the corridors of power, too. Nowadays it seems far too acceptable to blame immigrant Muslims for many of the fiscal ills of Europe – or spendthrift Greeks & Eastern Europeans – when if we actually look at the figures we can see that the richest countries in the EU were actually the worst offenders before the economic collapse; it’s just that we were also the best equipped to recover soonest.